Mulvadi Hawaiian Coconut and Guava Syrup. Used by the finest restaurants and hotels in the State of Hawaii. 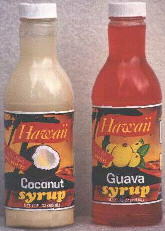 These wonderful syrups are made in Hawaii and can be used on pancakes, waffles, desserts and Pina-coladas. Make the perfect Hawaiian breakfast with these gourmet syrups, over poi pancakes. One try and you'll taste the flavors of the islands, all over again. These syrups are 10 fluid ounces.